Talk Like a Pirate Day really should be a national holiday. How many days can you truly justify talking like a pirate without having people look at you like you've got a screw or six loose? 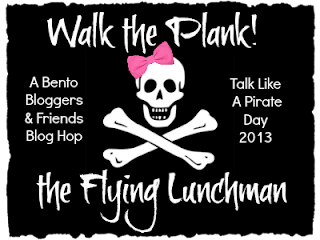 To celebrate Pirate Day, some bento blogger friends and I have put together two awesome pirate themed blog tours--the Flying Lunchman and Black Bread's Revenge. So, what is for lunch today? Well, it's actually more of a snack box, since Faith needed one of those! 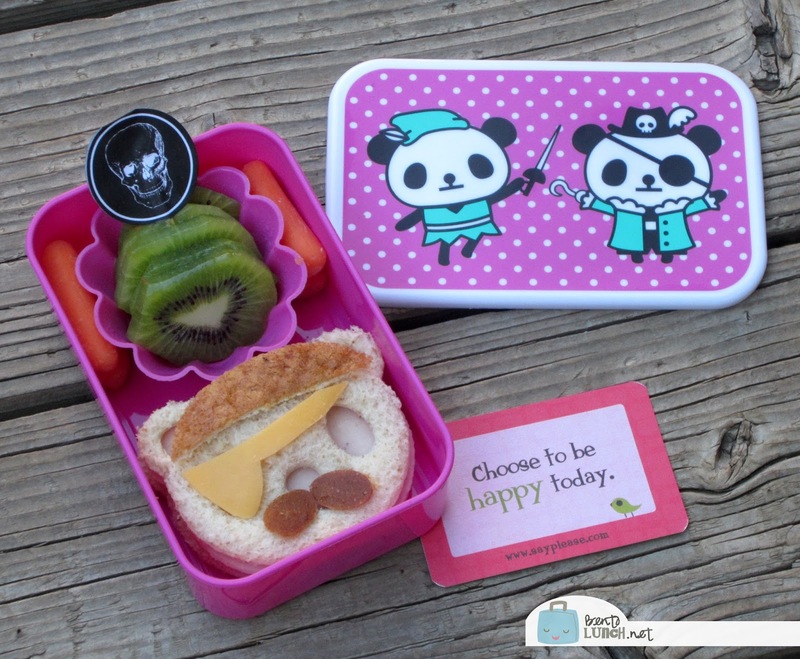 She has a very ferocious pirate panda, made from black pepper turkey, mild cheddar cheese, and honey wheat bread. The panda itself is cut with our CutezCute cutter. To make the mustache, just use the face template to make two extra panda eye cutouts and use a dot of cream cheese to stick them to the top piece of bread. I used the heel of the bread to get the darker color. The hat is made from the very bottom of the hollow face shape, and trimmed with a knife to get the straight line. Affix that to the bread with a dot of cream cheese too. The cheese eye patch is cut, freehand with a knife, using a cookie cutter as a guide. To go with that, she has less pirate-y kiwi and carrots, along with a pouch of animal crackers (not pictured). We're packed in a pirate panda themed box that a sweet friend got for us in Japan! To follow the blog tour, click the pirate flag below to visit Anna at Becoming a Bentoholic! 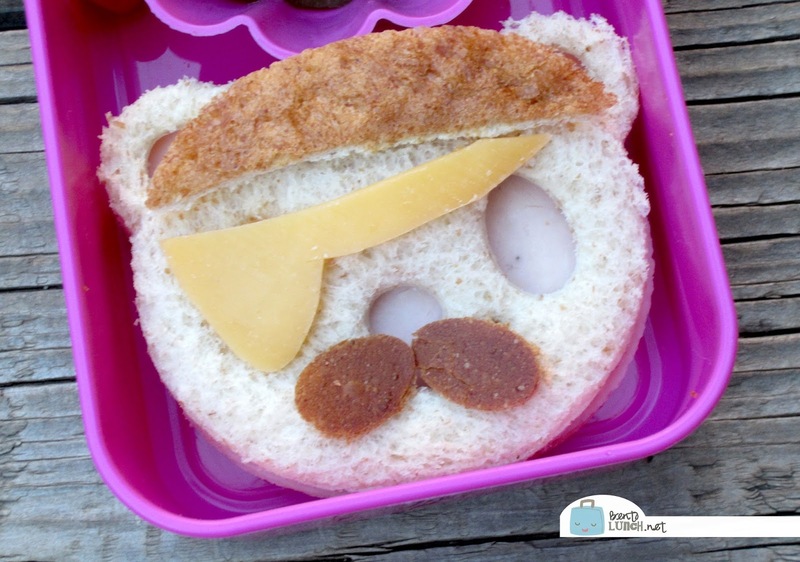 Once you've traveled the seven seas on the Flying Lunchman, click here to find more awesome pirate lunches on the Black Bread's Revenge. Love how you created the details on your pirate - awesome eye patch and mustache! Love your box, but that bento is freaking ADORABLE!!! The mustache is genius! Love the Panda Pirate and I agree: LOVE the mustache!! Your pirate panda is so cute, and love the box! Yo-ho-ho! OMGosh! That pirate panda is adorable and what a perfect box! Your pirate panda is utterly adorable! Your pirate is adorable. I love that the box matches the theme! Ahoy panda pirate, yo ho ho! Love the moustache on the pirate! Adorable sandwich, and the most perfect box! Adorable panda pirate! love it. Super cute pirate, and I love the matching box!